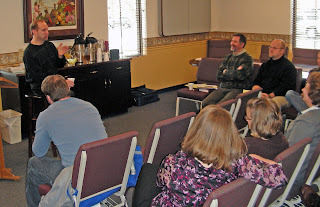 Robert Kellemen, Ph.D. talks about learning and growing as a biblical counselor during a seminar this morning (February 19) at the Winona Lake (Ind.) Grace Brethren Church (Bruce Barlow, lead pastor). Pastors of the Heartland District of Grace Brethren Churches participated, along with Warsaw (Ind.) area pastors and counselors. Dr. Kellemen, who is the author of the BMH Books, Soul Physicians and Spiritual Friends, also led a question-and-answer time on biblical/Christian counseling. He is also speaking at Grace College in the Graduate Department of Counseling and Interpersonal Relations’ Social and Cultural Issues class tonight at 6 o’clock in Science Building 210.